There is an old saying that goes, "If you marry a mountain girl, you marry the whole mountain." For many of us, who live in the shadows of Mount Washington, we can't separate the mountains from ourselves, or for that matter our culture, identity or economy. Our landscape draws, holds and defines us. We learn to respect nature's awesome power. On those rare occasions, when mankind outwits Mother Nature, we hold those stories dear as they offer us some hope. Such is the case with Mount Washington's long-standing record of having the strongest documented winds. So, we are naturally upset to see our beloved mountain and her famous record beaten by 254 mph cyclone that blew over Barrow Island, Australia in 1996. The Mount Washington record was reminder of man's near constant quarrel with nature. Unlike many, who live in less wild, more domesticated places, we have had neither the power nor the inclination to remake our landscape to meet our commercial desires. We live with what we got. What is most troubling about the decision of the Meteorological Organization, who spent 14 years studying the validly of Australia's feat, is not that we were beaten, but how the winning wind was recorded. The record-breaking wind was measured by an automated weather sensor in a totally un-staffed station. Not a single human being participated or was even discomforted by this triumph. By contrast, the 231-mph wind at Mount Washington in 1934 was recorded by scientists, whose passion led them to literally battle a wind that was nearly three times stronger than an average hurricane or as a Concord Monitor writer observed "strong enough to up root trees." Author Eric Pinder, who worked for years at the Mount Washington Observatory, told me, "They had to keep the anemometer free of ice, so that it could accurately measure the record wind." This is a harrowing, physical drama to recount. While their station building was being thrashed by the fierce winds, the observatory crew climbed onto the roof then crawled across its peak and with a sledge-hammer broke the ice that was preventing the device from working. 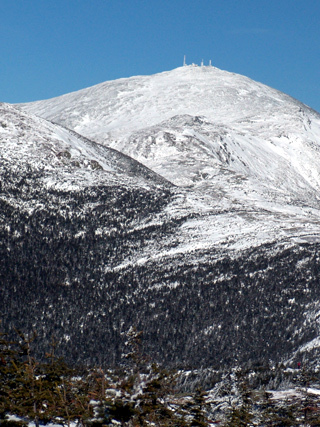 Mount Washington's historical claim - had little to do with the speed of the wind, but rather, it was about the courage of the men, who risked it all, to record it. Stronger winds have blown cross this earth for sure, but its power was never documented by man. In Australia, it was not man, but man's tools, that triumphed. It is this technical inhumanity that so easily confuses observation with participation and improvement with preservation. --Jeff Woodburn, of Dalton, NH is freelance writer and teacher.